Real Madrid are reportedly preparing an offer for a top Premier League goalkeeper – but one that is far less fashionable than Manchester United’s David de Gea. 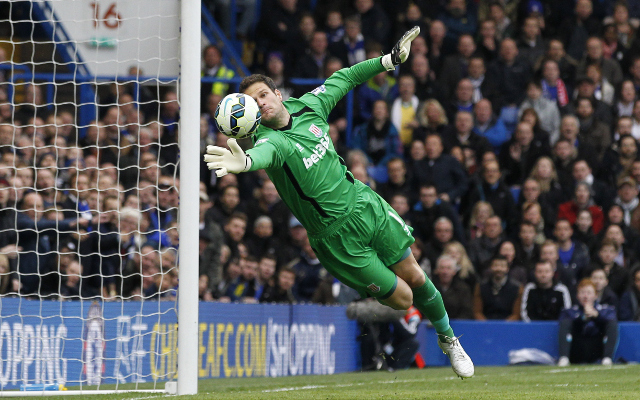 The Spanish giants are said to be eyeing Stoke City’s Asmir Begovic, who is entering the final year of his contract at the Britannia Stadium, as a replacement to the faltering Iker Casillas. Casillas is entering his final playing years at the Santiago Bernabeu and, despite Football Espana reporting that he’d like to run down his current contract, Real boss Carlo Ancelotti remains eager to sign his successor in the summer. The La Liga giants have been linked with United stopper de Gea for much of the campaign, yet the Daily Star now report that the club are preparing an offer for Stoke’s impressive keeper Begovic. The 27-year-old is likely to be available at a cut price with only one season left on his contract. The reports claim that while Potters boss Mark Huges would rather keep the Bosnian – an offer around £10m would be difficult to turn down. However, the Star also claim that Begovic is being monitored by a host of top Premier League clubs: Liverpool, Arsenal, Manchester United, Manchester City and Tottenham Hotspur – that could rival Real Madrid for his signature.